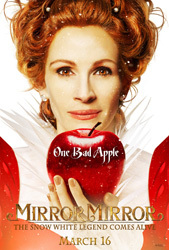 Mirror Mirror is a 2012 comedy fantasy film based on the fairy tale “Snow White” by the Brothers Grimm. It is directed by Tarsem Singh and starsLily Collins, Julia Roberts, Armie Hammer, Nathan Lane, and Sean Bean. I recently updated a useful tool I had created in python, to help Barxseven further streamline their nuke pipeline for work they were doing on “Mirror Mirror“. The tool is a specialized output helper, designed to automate the process of taking an image sequence and outputing a version of it in a new file format (.mov, .jpeg, .dpx, etc), for delivery to the client. A thumbnail image representing the image sequence is generated by the script and baked onto the slate (specific slate layout matches client request). The image sequence output also receives a burn-in on each frame consisting of the shot+sequence names, the frame number, and the number of frames in total. The output helper offers a number of pre-determined formats available for output (preset specs are set to match the client’s requests from editorial). The tool also allows for the quick creation of light-weight proxy images. This tool saves artists a great deal of time and also eliminates the likelihood of human error. The key is that it creates the slate and burn-ins automatically by parsing the path of the source image sequence. Special thanks to my buddy Pete O’Connell, who first got me onto python for nuke, as well as having kicked off the first incarnation of the output helper. Posted on Sunday, July 1st, 2012 at 9:41 pm. Filed under: Uncategorized	RSS 2.0 feed.